Our handsome Golden Gate Bridge magnet set features 4 magnets, each with a stunning image of the Golden Gate Bridge printed in bold colors! Add a little flair to your refrigerator or whiteboard! "The bridge they say could not be built." The building of the Golden Gate Bridge was a fantastic feat for its time, and still stands as an iconic landmark. Now you can have a view of the Golden Gate Bridge right from your refrigerator, even when its foggy outside! Our Golden Gate Bridge Magnet features a vintage inspired painting of the Golden Gate Bridge printed in bold colors. 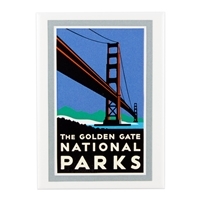 Bring home a reminder of your trip to San Francisco with our handsome new Golden Gate Bridge magnet! Printed in bold colors, the vintage-inspired image will brighten up any refrigerator door or whiteboard!